D enny Hamlin finished 11th in Sunday’s NASCAR Sprint Cup Series race at Michigan International Speedway, battling track position throughout the 201-lap event on the two-mile track won by Greg Biffle. Hamlin started 21st in the #11 FedEx Office Toyota and quickly moved up into the top-15 in the early going. 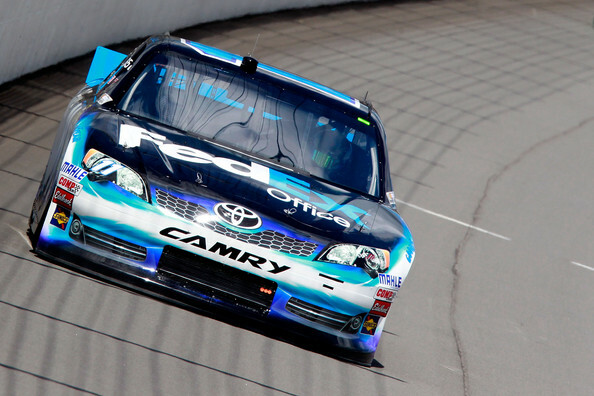 A caution near the race’s midpoint saw Hamlin sustain minimal right-front damage. He came to the pits for repairs, but had to restart back in 28th. A caution shortly after allowed Hamlin to move up as the leaders pit, and a long green-flag run shuffle the #11 car to the lead for a lap prior to the race’s final caution period. The finish kept Hamlin 10th in the NASCAR standings following Michigan, 96 points behind leader Biffle after 23 of 26 regular season races. The Series returns to action at Bristol (Tenn.) Motor Speedway on Saturday, August 25.